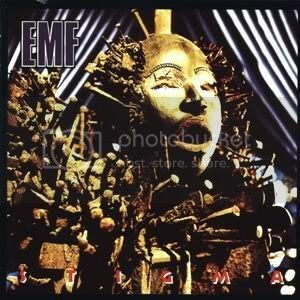 EMF-TheBand.com :: View topic - Similar to EMF? Posted: Sun Dec 02, 2007 6:38 am Post subject: Similar to EMF? I love EMF - obviously - but the only other music that I have which comes close is Jesus Jones (I Have all of their releases besides Culture Vulture EP - which I really need to get!). On Amazon, there was a suggestion that a 90s band called 'Space' was influenced by EMF - anyone ever heard of them? What about 'Ned's Atomic Dustbin'? I have never heard of them. but a friend told me they were like EMF. Can anyone suggest similar bands? I really need to expand my music collection, but I know what I enjoy. hey jason. ned's are a great band too. i suggest you to listen god fodder, that's my favorite atomic album. there are clear differences with jesus jones & emf, i can tell you, but give a try. Ned's is a great band - not exactly like EMF and JJ, but really good. Start with Godfodder for sure. Soda stereo is an argentinian huge band, let's say it's the latinoamerican most important band, and they also a lot of bands have been influenced by them. i suggest dynamo for your listening pleasure. the fact that emf and jesus jones influenced Soda Stereo is a real honor to be proud of. I have only heard one Ned's song, but it seems cool. Thanks for all the suggestions - keep 'em coming. Space were a bit odd but they did some good songs. Female of the Species and In my Neighbourhood (I think). They were from Liverpool. Wouldn't say they were like the boys though. What about KLF? They sure don't make music anymore like they did in the early 90s! Ned's is awesome. I have been listening to "Are You Normal?" - great stuff. Just noticed this thread -- no one mentioned PWEI? A little harder than EMF, but Pop Will Eat Itself have a similar dance/rock hybrid (more rock than MEF, but you get the idea). Also - a Canadian band called Pure have always seemed like distant cousins to this scene... their first album (or 2) anyways - a disc called Purefenalia. Well worth checking IMHO. Well, I madly love Ned's now. I have all of their albums, except for a few rare remix/ b-sides releases. I listened to a bit of PWEI, but I think it was too heavy for me.